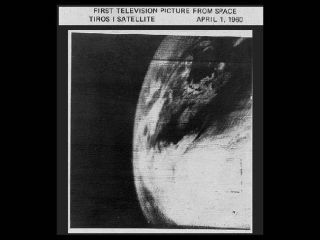 The first photo of Earth from a weather satellite, taken by the TIROS-1 satellite on April 1, 1960. Early photographs provided new information on cloud systems, including spiral formations associated with large storms, immediately proving their value to meteorologists. Thoseiconic images of the Earth rising above the moon and the blue of the oceansagainst the blackness of space may seem like old hat nowadays – a view of Earth almost everyone recognizes. Butthese whole-globe photos have only been available since the dawn of the spaceage, just before the birth of Earth Day, when satellites, spacecraft andastronauts have changed mankind's view of our home planet, showing us thebeauty and fragility of the Earth in images taken from space. "Overthe last 50 years, satellites have revolutionized the way we see Earth,"said Holli Riebeek, an education and publicoutreach coordinator for NASA's Terra satellite mission. "For the firsttime, we can see Earth as a planet, study Earth as a planet." In ancient times, humanity's view of the Earth was rather limited. Some sagesthought the world was flat, or filled with dragons and sea monsters inunexplored swaths of the oceans. It wasn't until intrepid seafarers begancrisscrossing the oceans in search of new worlds and riches that most peopleaccepted the planet was round. Since then, bigger satellites, space probes and better cameras for astronautshave revealed Earth in crystal clarity. 1958– Explorer 1: The first American satellite launched into orbit,Explorer 1, gave scientists measurements of Earth's electrically chargedionosphere and protective magnetic field, though it didn't take any photographsof the Earth's surface. 1960– TIROS-1: The world's first weather satellite, it was launched 50 years ago.While TIROS-1's images of the Earth and its weather systems were crude bytoday's standards, they gave scientists their first view of storm systems on alarge scaele. In its firstblack-and-white image, TIROS-1 saw a fuzzy band of clouds over the UnitedStates. "The early TIROS satellites were basically a television camerathat relayed images to ground stations on Earth," Riebeek told SPACE.com. 1968– Apollo 8: The first astronauts ever to see the entire planet as a distant orb in a sea of blackspace were the three Apollo 8 astronauts, who took the iconic image of Earthrising over the limb of the moon in December 1968. 1990– Voyager 1: Launched on Sept. 5, 1977, Voyager 1 was sent to getclose-up views of the planets of the outer solar system. In 1990, havingcompleted its primary mission, the spacecraft turned around to take a"family portrait" of all the planets in the solar system. On Feb. 14of that year, it snapped the famous "pale blue dot" image of Earth at adistance of more than 4 billion miles (6.4 billion kilometers) from the planetthat launched it. 2003– Mars Global Surveyor: This Mars orbiter was launched to investigateour ruddy neighbor, but in 2003, it pointed its camera homeward and captured a surprisingly detailed image of our blue world suspended inthe vast black of space. It was the first image of Earth taken from anotherplanet in which the continents and clouds of the Earth were visible. 2004– Spirit: After arriving on Mars, the Mars Exploration Rover Spiritlooked up into the Martian sky and snapped a picture of Earth -- the first ever taken from the surface of anotherplanet. The photo showed Earth as a bright dot above the horizon about an hourbefore sunrise. 2007– Kaguya (SELENE):This Japanese moon probe replicated the famous Apollo-era"Earth-rise" photograph with modern high-definition imaging. Kaguya took a series of still images that show the Earth setting belowthe lunar horizon. 2010– The International Space Station: After more than a decade ofconstruction by 16 different countries, the $100 billion space station finallyreceived what some astronauts consider its crown jewel – a seven-window observation deck that offers panoramic viewsof Earth from 220 miles up. Called the Cupola, the deck includes the largest space window ever built and is a favorite haunt forastronauts hoping to look down at their home planet. Theseof course are just a bare sampling of the images of Earth as a whole andclose-ups of its features that have been taken since humans first launched intospace. The Earth is literally surrounded by weather and other observationsatellites keeping close watch on the planet's air, land and seas. MayEarth-orbiting satellites have allowed scientists to see whole landforms – such as rivers, forests and deserts ? and connect Earth's interacting systems from weatherto earthquakes in a way that wasn't possible before we could take a bird's-eyeview of our planet. Andsince the first generation of satellites was launched, each subsequent generationhas made improvements on Earth-observing capabilities with higher resolutionimages and expanded sensing capabilities. For example, this image compares an early TIROS view of the Earth withone of the same area taken by Terra's MODIS sensor. Newsatellites are even starting to take 3-D views of the planet. NASAcontinues to build and launch satellite and spacecraft that will obtain moreand better images of the Earth, including examples of how humans have alteredthe Earth with satellites dedicated to monitoring climate change and themelting of the planet's ice.